The attempt by the Heart FM media group to win Limerick’s 10-year radio license, currently held by Live 95, has failed, as the Broadcasting Commission of Ireland announced last Monday that it would award a renewal to Live 95’s license. The Heart FM group was funded in part by Cranberries members Noel Hogan, Mike Hogan, and Fergal Lawler, among others. Mike Hogan was poised to become a director for the new radio station if it was approved. Thanks to Thomas for the news. When Niall announced that he was leaving the rest of us decided straight away that we wanted to continue. He introduced us to someone who was interested but in singing but the guy messed us around and we ended up auditioning a fella called Alan who was heavily into the doomier side of The Cure. He wanted to drown all the songs in feedback and distortion, which isn’t us at all. The only good thing is that it made us realize that we need a soft, gentle voice because we’re not that heavy. That’s when we decided to advertise in Xeric [Studios] for a girl and we struck lucky straight away. The girl who responded to that ad, of course, was Dolores O’Riordan. Niall says that the interviewer was probably Stuart Clark, who is now an editor for Hot Press, Ireland’s largest entertainment magazine. The Cranberries’ classic 1994 performance on the Jools Holland show on the BBC will re-air next weekend on German network ZDF: Theaterkanal. The band performed “Dreaming My Dreams,” while Dolores performed “No Need to Argue” with Holland on organ and a string quartet. The show that features The Cranberries, Crowded House, the Auteurs, and Aswad will air February 3rd at 23:00 local time on ZDF: Theaterkanal (schedule). Thanks to dominestar for the tip. 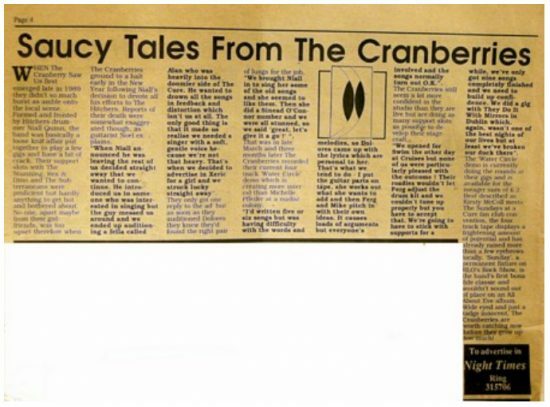 Screen capture taken from Cranberries Shows. The Cranberries’ “Zombie” was used on last night’s episode of “The Office.” Andy Bernard, a character in the series, is evidently a fan of the song. If any watched the show, tell us about it in the ZG Forums. The repeat of the MTV Unplugged performance is no surprise since Stern has repeatedly professed his, er, certain fondness for Dolores O’Riordan’s short- cropped hair. Thanks to ZG’s venerable founder John for the news.